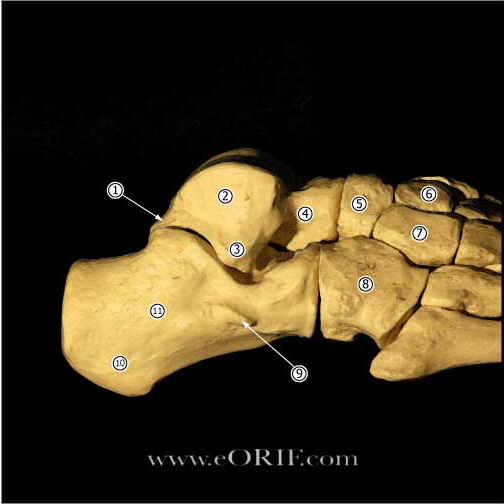 Anterior portion of the talar dome is @2.4mm wider than the posterior portion, making the ankle much more stable in dorsiflexion than in plantarflexion. 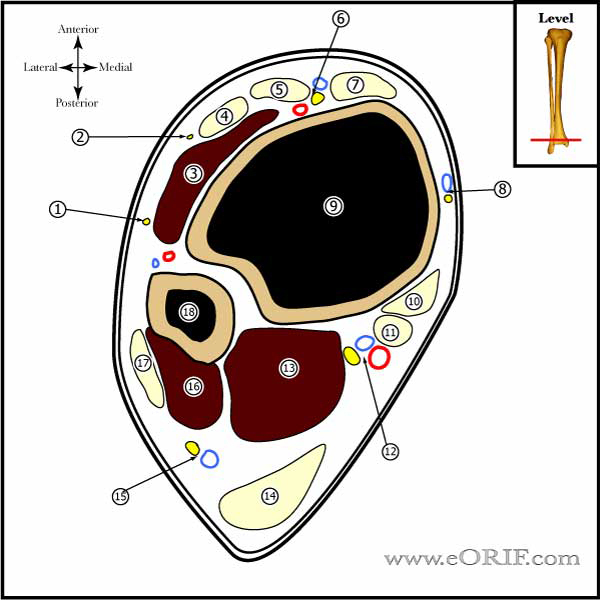 Orign: anterior aspect of the distal fibula 1 cm from the tip of the lateral malleolus. 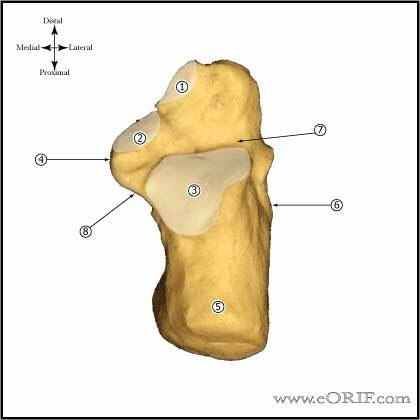 Insertion: lateral aspect of the talar neck just distal to the articular surface 18 mm proximal to the subtalar joint. Primary restraint to inversion in plantar flexion. Also resists anterolateral translation of the talus in the mortise. 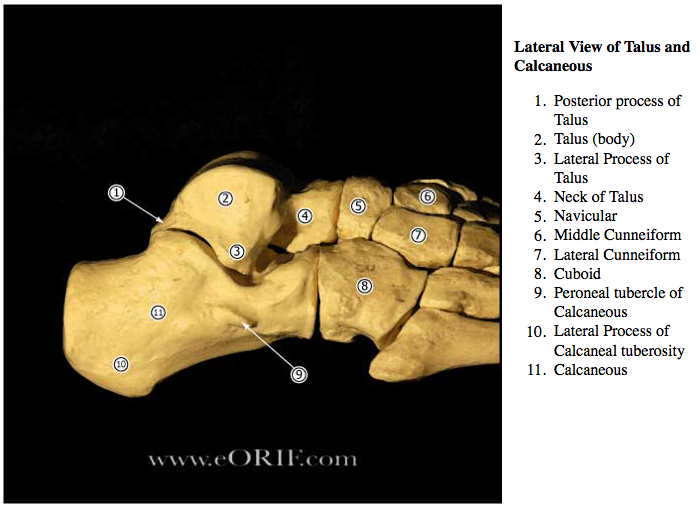 Insertion: lateral wall of calcaneous, 13 mm distal to the subtalar joint, deep to the peroneal tendon sheaths. Angled 133 degrees (range, 113 to 150 degrees) in relation to the fibula with the ankle in plantigrade position. Primary restraint to inversion when the ankle is in neutral or dorsiflexion. Limits talar tilt. Origin: posterior (Volkmann’s) tubercle of the tibia. 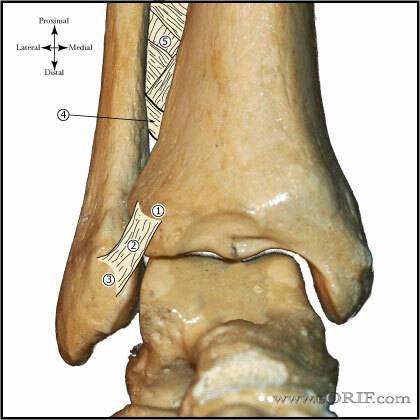 Insertion:posterior part of the lateral malleolus. 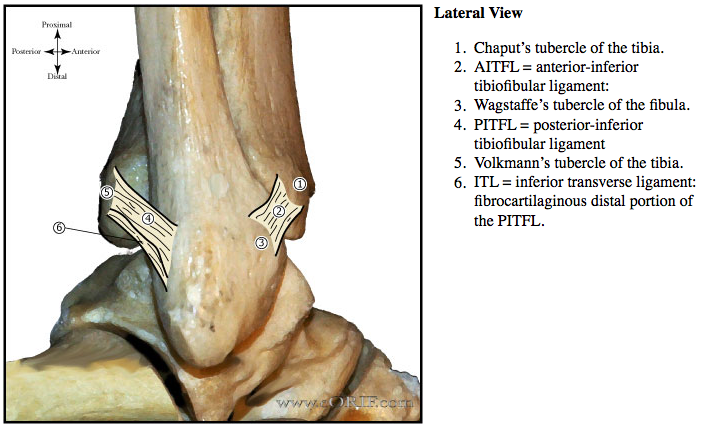 ITL = inferior transverse ligament: fibrocartilaginous distal portion of the PITFL. 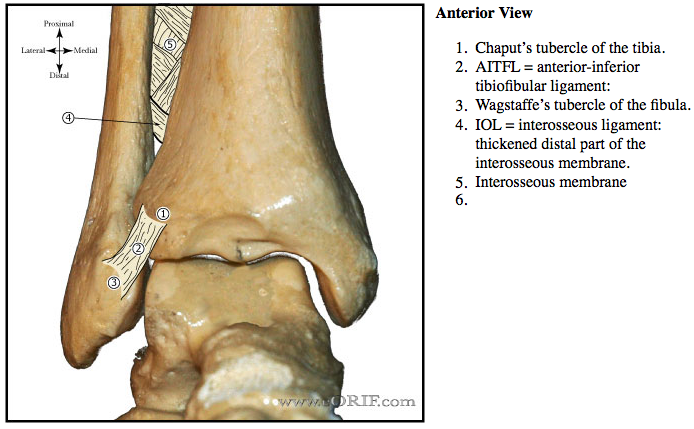 Origin: anterolateral (Chaput’s) tubercle of the tibia. Important in adolescent transitional ankle fracture configuration. Funtion: extention of the articular surface of the talus. Has superficial and deep portions. 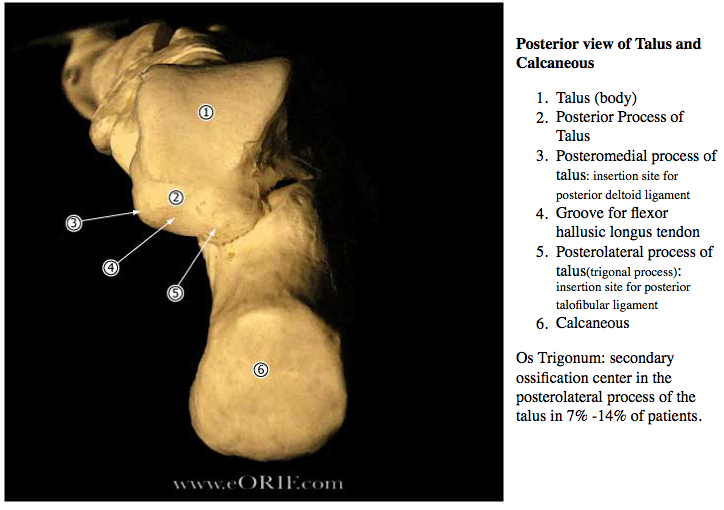 Superificial: tibionavicular, calcaneofibular and posterior talotibial ligaments. consists of: AITFL, IOL, interosseous membrane, PITFL, and ITL. thickened distal part of the interosseous membrane. sensory nerve formed by the medial sural nerve (branch of the tibial nerve) and lateral sural nerve(branch of the common peroneal nerve). Courses between the heads of the gastrocnemius, eventually emerging though the gastrocs fascial covering. Travels in the superfical posterior compartment of the leg. 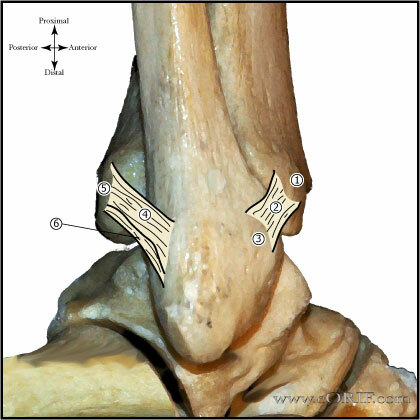 It crosses near the midline at the level of the musculotendinous junction of the achilles (@9.8 cm from the calcaneus) before descending to its more lateral location distally. At the level of insertion of the Achilles into the calcaneus, the sural nerve is 18.8 mm from the lateral border of the Achilles tendon. (Webb J, Foot ankle Int 2000;21:475). The sural nerve supplies lateral calcaneal branches to the heel, then descends 1-1.5 cm behind the lateral malleolus, anterolateral to the short saphenous vein suppling sensation to the lateral malleolus, Achilles tendon, and the ankle joint. The sural nerve continues on the lateral aspect of the foot supplying sensation to the skin, subcutaneous tissue, fourth interosseous space, and the fifth toe. Can be injured during surgery for Achilles tendon rupture. Travels with the Lesser Saphenous during much of its course in the leg. Innvervates the lateral heal pad. 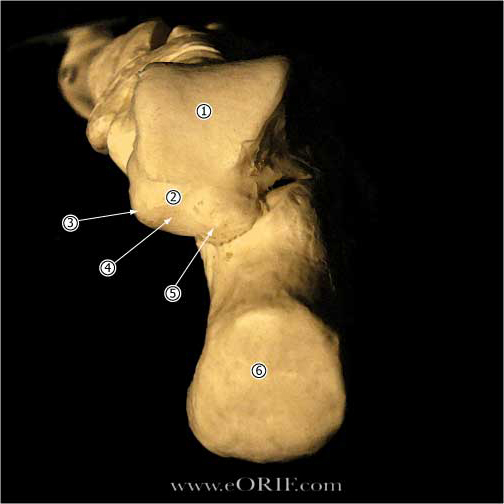 May be injured during posterior portal placement during Ankle Arthroscopy (Sitler DF, JBJS 2002;84A:763). Medial malleolar ossification center appears at 7 years old, closes at 10yrs old. Ossification center appears at 9-24 months. Closes around 16 in girls and 18 in boys.